The cultural and conference centre Casino was built in 1899 – 1901 in the Italian new renaissance. Various unique social events and balls have taken place in this very place since its beginning. It reached its zenith in 1946, when the 1st International Film Festival, today known as the Karlovy Vary Film Festival, was organised here. Casino today: used for concerts, especially concerts for spa guests performed by the West Bohemian Symphonic Orchestra, graduation and other balls, lectures, exhibitions and fashion shows. Among others, the Casino’s premises are often used for various conferences and congresses. Every year, the opening and final concert of the Chopin festival in Mariánské Lázně, with the participation of top conductors and musicians from all over the world, takes place here. Marble hall: Architecturally, the most interesting room is the Marble hall. It is also a very popular place for holding various cultural events. In 1946, the 1st International Film Festival, in the then Czechoslovakia, was held in this very place. Mirror hall: The Mirror hall is suitable for holding conferences and specialist seminars. 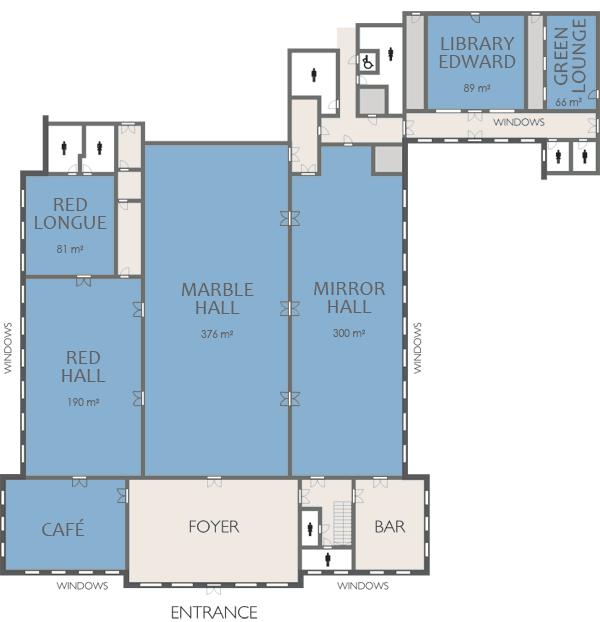 Red hall: The Red hall belongs among architecturally rare halls and it is suitable for various conferences and seminars. Danubius Health Spa Resort Nove Lazne offers the Edwards Library, a luxurious multi-functional room for smaller conferences and social meetings or its Green Lounge.